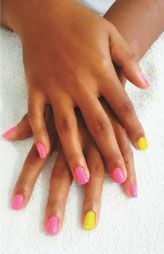 Gel nail application provides the strength of acrylic nails with the appearance of natural nails. Gel only dries when it is exposed to UV light. – Most versions of gel nail polish often need to be filed off rather than soaked off. -If your nail breaks or shatters, self-fixing may not be your best option. You will need to schedule an appointment with your nail technician ASAP. For any questions or comments contact me at onfleekthisweek@gmail.com or address letters to On Fleek This Week C/o Searchlight Newspaper, Lower Kingstown Park, PO Box 152, Kingstown.